If there was such a thing as a PhD offered in Fly Fishing, Travis Johnson would have earned one…some time ago! Travis’ upbringing in the sport of fly fishing is not really different or less boring than any other avid angler or industry insider. However, there are three things that set Travis apart as a fisherman and full time guide: Drive, Perseverance and Knowledge. If it has been written, he has read it. If there is a chance the sun will rise again, he’ll be the first one at the boat ramp with a warm smile, accompanied by a thermos full of hot coffee. Most importantly, he knows his bugs, timing and where they will be coming off, or the most likely spot to find a rested anadromous fish that is ready to play. Oh, and did I mention he can tie flies masterfully and owns two distance casting championships on two different continents? 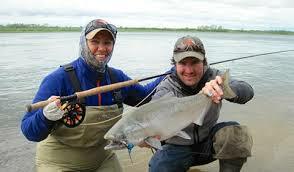 In short, Travis has learned his craft and spent his fair share of time at the fly shop level under the tutelage of two of the best 30+ year professionals Fly Fishing has to offer. 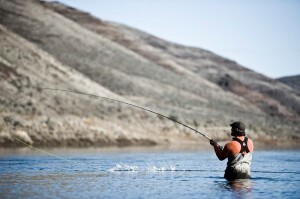 Caleb Lockyer is a skilled fly fishing guide working throughout Oregon and Alaska since 2009. Born and raised in Montana, Caleb spent his childhood admiring and learning the artistry and craftsmanship deeply rooted in fly fishing. Caleb’s family remembers him dreaming of becoming a fly fishing guide when he was a young boy. Spending many of his summers on the banks of Henry’s Fork watching the talented dry fly fisherman work water had a profound effect on his ambitions later in life. As the years passed he went on to earn a degree in Environmental Science and further demonstrated his passion for wildlife and habitat restoration. Caleb enjoys designing flies, spey casting, talking fishing and taking wildlife and landscape photographs. Fulfilling his childhood dream, Caleb guides for steelhead and trout throughout Oregon. Caleb now resides in Bend, Oregon with his fiance, Stephanie and their son, James.